Noor: In Washington DC on August 14, Freedom of the Press advocates delivered a petition with over one hundred thousand signatures to the justice department, urging the Obama Administration to cease its efforts to compel New York Times reporterJames Risen to reveal the source in his 2006 book that detailed botched attempt at sabotaging Iran’s nuclear weapons program.The Real News spoke to renowned journalist Phil Donahue, who helped deliver the petitions. Donahue: I’m Phil Donahue, and I’m here to make sure my grandchildren know that I was here when this was going down. I think this is a very important issue, and I’m pleased to make my small contribution toward it. Noor: The subpoena against James Risen and the fight against it has been described as one of the most important battles for press freedom in our generation. Talk more about the significance of this and if it goes against Risen if he is compelled to testify or if he is put in jail–what that would mean for the future of press freedoms today. Donahue: Well, I don’t know if too many people are going to have more enthusiasm for digging out news and finding sources that would be willing–have the courage to tell you, give you information that might cost them their job, if not their life, their livelihood.If Risen were to be in prison–I mean, we’ve already got a very tepid media. Every major metropolitan newspaper in this country supported the invasion of Iraq–all of them. So, I”m afraid we have had a go-along, get-along media that hasn’t pushed back,and this will just make it worse. Risen is one of those media people who rose above this, kind of, hand-out journalism and had the courage to blow the whistle on a very, very important feature of our nation’s history at this moment, and that is the intelligence establishment.And he embarrassed him, and that’s why they don’t want any press on this.We think he should be put on a pedestal, and we have an administration who thinks he should be put in prison. Noor:Why is this important now, especially under a democratic administration? Donahue:I think it’s an example of the fact that power corrupts. Power doesn’t want you looking under the tent. Power wants to make decisions that are good for you. And when we make these decisions, you have to agree, and we want you to just shut up and sing.We’re very disappointed, truly disappointed that the Obama administration would be so aggressive, so enthusiastic when it’s clear we have so much–especially about the intelligence agencies–that has to be revealed. You know, we can have any kind of country you want.You want to have somebody listening in on your phone calls, you can have that kind of country. You want to give them that kind of power to put people in jail without due process–. 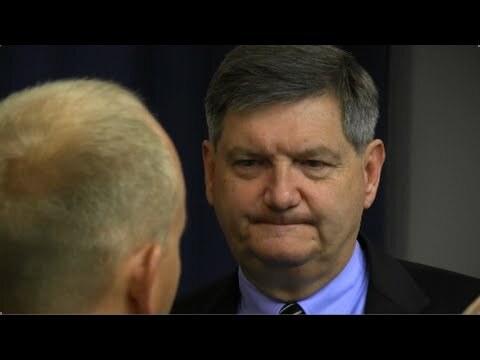 We’re a nation of law unless we’re scared.And that’s going to keep on keeping on if we don’t have more James Risen’s standing up in the real tradition of the first amendment and speaking truth to power. Risen: I don’t know what’s going to happen, but I just think that there’s nothing more fundamental to our democracy than freedom of the press. We can’t have a democracy without it, and you can’t have freedom of the press without aggressive, investigative reporting. And you can’t have aggressive investigative reporting without the ability to have confidential sources. Noor: And your thoughts on the fact that it’s the Obama administration–now years after the original subpoena, years after your story, which you withheld for years–going after you with full force. Risen: Right. I mean, now it’s been two administrations who have both come after–both continued this for six years. And so, I’ve kind of realized it’s–I don’t know what you would say. I’ts just strange that it’s been continued this long by the government. Noor: And your overall thoughts on how the Obama has treated whistle blowers and journalists, who they’ve leaked information to? Risen: Yeah, I mean, I think it’s been well-documented that they have–as several people here said, they’ve gone after more whistle blowers than any other administration in American history. And I really don’t understand why. I don’t understand why they’ve done this when it is so antithetical to press freedom in America. Noor: And the issue is raised that this is not only–you’re case is not only going to have implications here, but it’s also going to have implications throughout the rest of the world as well. Risen: Yeah, I think if the United States is not a model for the world on this issue, then other nations will take their cues from the United States and crack down on the press.So I think that’s dangerous. Noor: So you do a lot of these national security reporting these confidential sources, but talk about the importance of mass movements and public pressure in making sure these freedoms are upheld. Risen: Well, I just wanted to–as I said, I just wanted to thank everybody for their support, and hopefully, the fact that more people are getting involved and showing their support, will send a message to the government that they should change their approach on these issues . Noor:For The Real News, this is Jaisal Noor in Washington. Phil Donahue and the Donahue show have been honored with 20 Daytime Emmy Awards, including nine for Outstanding Host and a George Foster Peabody Broadcasting Journalism Award.